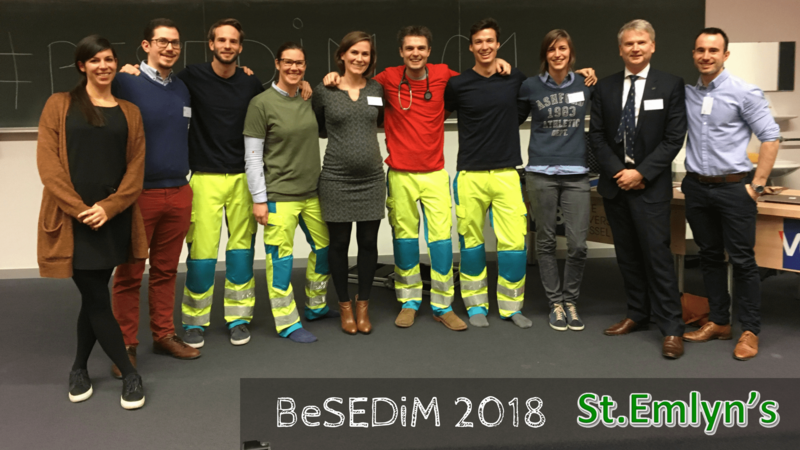 Last weekend, the BeSEDiM (Belgian Society of Emergency and Disaster Medicine) organised their annual symposium. It is the scientific organization of the Belgian emergency physicians with Said Idrissi as chairman. 13 years ago, Belgian Emergency medicine was born as a full-fledged training programme. It became very popular among young doctors and more and more enthusiastic Emergency physicians are graduating now. We are very proud to be Emergency physicians and we fulfill our job with a lot of passion and devotion. However, the road is still long, and our position is not always as strong as we would like it to be. That’s why we have to improve ourselves every day. We have to demonstrate clinical excellence and we have to be strong as a group. That is why conferences like this play an important role for the growth of our specialism. On days like this, we can teach and we can learn. We can enjoy meeting new colleagues and friends we haven’t seen for a long time so we feel stronger as a group again. Since Belgium is a multilingual country, you hear 3 languages on this conference: Flemish, French and English, which also gives it an interesting cultural dimension. After this day, we regained an inspirational and boosting energy. That’s so important for us to continue to get the best out of ourselves and each other. We are one team in Belgium. This is the amazing future of emergency medicine in Belgium! We started the day by listening to Simon Carley who gave an impressive lecture about decision making. All this can be read in detail here and should be reading material for every emergency physician! This track was introduced into the conference for the first time this year! It was not only for young doctors nor was it only presented by young doctors, but the subjects were chosen by them and the atmosphere was lively and vibrant! Bart Massaer (http://www.sitca.be/) explained the major importance of CRM-training and gave us some practical tips&tricks for simulation practice. He started by pointing up the danger of hierarchy, illustrated by the sad case of Elaine, the wife of pilot Martin Bromiley. She died in the operating room because of an unexpected difficult intubation, where one of the major problems was that the nurses were holding back instead of indicating the need to go to plan B. We really need to try to reduce hierarchy and we can practice this in the simulation lab. Simulation practice is an effective learning method for skill retention, as there is a skill retention of 75%, compared to the low number of 5% by powerpoint teaching. “Feedback is the breakfast of champions” as we all need to have a feedback seeking behavior and need to give constructive feedback ourselves. The importance of feedback (in the context of decision making) was emphasized by Simon Carley as well. So, feedback needs to be searched in all aspects of work and life. Marc taught us some important aspects of goal setting through the “SMART”-principle: The goal needs to be specific; we need to consider what we want to do. It needs to be measurable as well so that we know when the goal will be reached. Next, it must be attainable and in our power to accomplish it. Furthermore, the goal must be relevant and finally, it must be time-bound, we need to know exactly when we want to accomplish it. The importance of time-management was highlighted by showing the famous grid of Stephen R. Covey (the 7 habits of highly effective people). We need to be occupied as much as possible with things that are important but not urgent. These are aspects like planning, relationship building, creating a vision,… We need to plan them. Urgent and important aspects need to be done right now. Unimportant stuff needs to be delegated (urgent) or deleted (not urgent). What we do as physicians, namely saving lives, changing lives, or trying to make a difference, is not only done by the medical knowledge, but by the emergency physician who is trained in teamwork and leadership, communication, performing under stress,… These non-technical skills could be trained in the simlab and were live demonstrated by a stop:start simulation. After an Asian gong, the team froze and the doctor could reflect and learn from the speaker. If we don’t have the body language of a leader by having a powerful position (Amy Cuddy), our team won’t perceive us this way. This may lead to chaos and maybe even a bad outcome. Even if we don’t feel ready for it, we have to fake it! We all know that our mind influences our body, but our body influences our mind as well. The sim doctor was blocked by stress when he realized he needed to perform a difficult procedure. He got lessons about how stress influences our body, but that we can train this by doing stress inoculation training. During these, psychological skills can be practiced for appliance in real life. The nice thing about this ‘interrupted’ Sim was not only the fact that the audience really could identify themselves with the doctor because he was expressing his feelings (feelings we all maybe felled at a time in a comparable situation) but also the fact that the teaching focus was on the ‘soft skills’: The teacher emphasized details we don’t always realize we ‘re not doing great but if we would do it better it will make a difference. There was also the SimCup competition running alongside the talks. Amazing performance by teams from across Belgium. Multiple teams, multiple teams, multiple problems and solutions. – If our patient has a number of aspecific symptoms: always consider drug toxicity! – If we are not familiar to a drug on the patient’s list: look it up! – The use of ‘old’ drug Bismuth is coming back, get to know it! An A&A case report on an in-hospital cardiac arrest due to an intoxication with Taxus tea and leaves taught us thatIntravenous Lipid Emulsion can act as a time-winning bridge to ECMO. Another M&M case on a man with a Paracetamol intoxication showed us that we should be cautious with the Rumack-Matthew nomogram. This person had a toxic plasma paracetamol concentration at presentation. After a 20h treatment regimen of N-acetylcysteine this concentration dropped to a non-toxic level. He was admitted to a psychiatric ward but was shortly afterwards readmitted because of signs of liver failure. NAC was started again but this treatment failed and the patient needed a liver transplantation. A new investigation pointed out that the patient took a sustained release Paracetamol formulation. Following interesting case is about a man with an intoxication with Valerian. He developed facial flushing, angio-oedema, miosis, neurological findings and after propofol sedation the urine became pinky colored. The lecturers pointed out the usefulness of sifting the case to the bottom. In this case calling the pharmacist revealed the answer: he added an anticholinergic, that was not detected by the screening lab test of the hospital, to the Valerian, that caused the anticholinergic toxidrome. It is important to know the screening method used in your hospital so that you are aware of the fals positives and negatives. The pinky urine could be explained by the propofol in combination with a high uric acid. Another example of a good Sherlock Holmes attitude for toxicology was shown by a case of an old man who was brought in because of a decreased consciousness and miosis. He was admitted with the presumable diagnosis of a stroke, but further enquiry revealed that the patient accidentally took his wife’s Baclofen! Finally the wonderful Dr Nicholas Peschanski who is well known in the #FOAMed world spoke on the future of emergency medicine and it’s links to social media and a world where we can communicate and share freely. You can see his slide set here. Great slide set and inspiration for the future. Emergency medicine has always been changing and we are part of that change. These are incredibly exciting times and it’s such a pleasure to be part of it. Well there will be a BeSEDiM conference in 2019 and we will let you know through the usual #FOAMed channels when that will be. IN the meantime the ED of the Jessa Hospital Hasselt organizes a trauma conference on Saturday the 3rd of February 2018. It promises to be great and we’d love to see you there. It was a great day, and we are looking forward to next year already! Thanks for everyone who took part, and thanks to everyone who is working hard to develop Emergency Medicine in Belgium. Final thoughts from Simon Carley. It was an honour and delight to get to this conference in Brussels. The Belgian EM crowd are young, dynamic, interested and keen to learn and advance the speciality. If you get the chance to get over to Belgium then do so. If you can’t get there, then look out for attendees at EuSEM. They’re great fun and a pleasure to work with. Next: Next post: Is there anything else I need to know? Working in Africa.